Nozzlehead was created in 1999 through my personal experience with the fire service and emergency response community over the past 27 years. 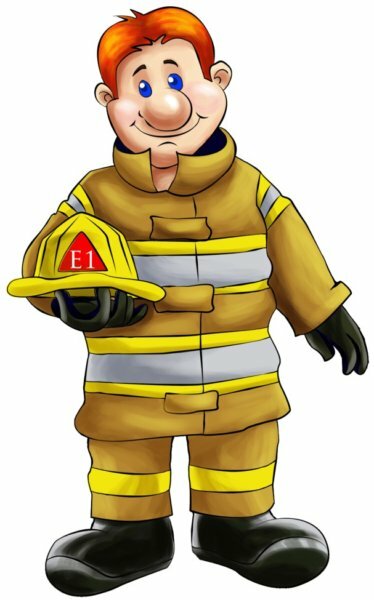 The concept was to create a kid friendly firefighter character and his team and to share a scaled down version of our actual 911 calls. The books will educate the public with an emphasis on kids as to the daily operations and responsibilities of a firefighter. Kids of all ages are enamored with the big fire engines and aid cars, the flashing lights and the sirens as they make their way to the next emergency. A major role of firefighters is to educate the public and to be approachable and engaging with adults, parents and kids. One of our major goals is to teach kids about fire safety and that firefighters are their friends. With our Bunker Gear, Masks and Breathing Tanks we look and sound very scary to a child which may caused them to hide in an emergency situation making it extremely difficult to rescue them. We want to remove the mystery and show them what is “behind the curtain”. We will put on our fire gear, our masks and air bottles while they watch us. We also let them touch and feel the components and then allow them to sit inside the vehicles and explore their imaginations. The Nozzlehead series books are enjoyable, enlightening and entertaining and allow the audience to get to know the characters well. Rather than creating one book, we have created three, giving the readers an extended exposure and building common characters for them to identify with. This also gives us the ability to make a more lasting impact and carry more messages to a greater audience which in turn may prevent more fires and save more lives. In developing the character we wanted to show a friendly, sincere, happy, responsible and dedicated individual named Nozzlehead. We also designed a crew who serves with him as his team. Each exhibiting unique qualities enabling the “team” atmosphere with an emphasis on “teamwork” throughout the stories. 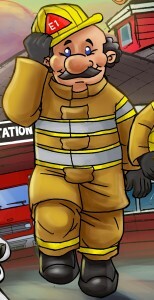 Nozzlehead, is a middle aged firefighter who always wears a smile and has a “can do” attitude. He will always find time to talk with and visit kids in the area. He also drives the fire engine. Nozzlehead is a name given to individuals who are very passionate about their job as a firefighter. Next is Halfcap. He is the seasoned (older, wiser) veteran firefighter with a playful disposition and a no nonsense approach to keeping others safe. Halfcap loves to whistle and to cook. In fact, he is the cook for the firehouse. Halfcap’s name was derived using a nickname that was given to me due to my zeal for training, diligence and work ethics. Originally it was an insult because I was extremely motivated. I love the name. We introduce Scout as the newest and youngest firefighter. She is especially gifted with animals and kids and is very clever in figuring out difficult tasks. She is always eager to assist Nozzlehead and Halfcap in all of their adventures. 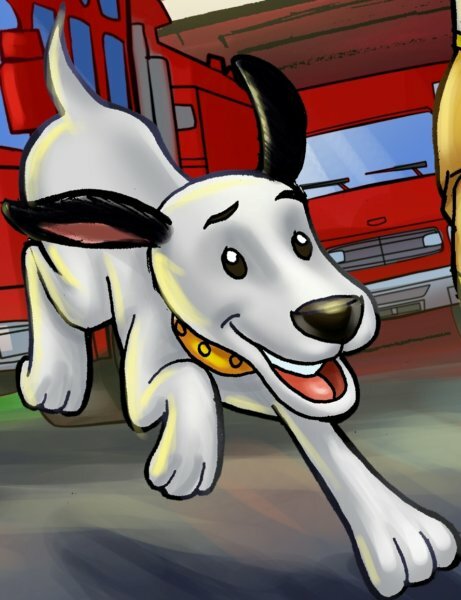 Finally, our special friend Spotnot, the fire station dog. Spotnot is a unique Dalmatian in that he has no spots. He has an incredible ability to smell smoke from up to a mile away. He also serves as a rescue dog to help the team locate people and other animals who might be lost in a fire or smoke. © 2018 Nozzlehead. All rights reserved.